“I AM HE whose life and soul are torment,” bemoans the poet-narrator in the prologue to one of the most visually stunning masterpieces of film ever to be witnessed on screen. 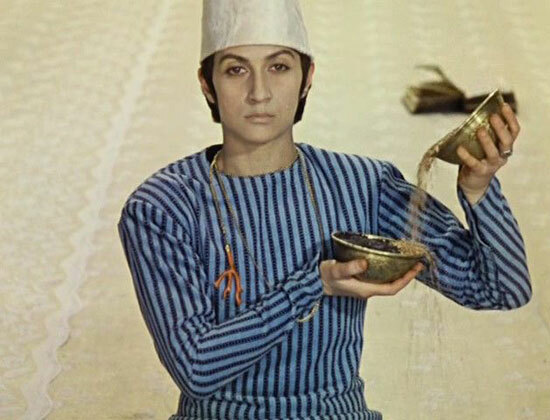 Written and directed by Sergei Parajanov (9th January 1924–20th July 1990), The Colour of Pomegranates is a poetic biography of the eponymous 18th-century Armenian minstrel and bard, Sayat Nova, the “King of Songs”, recounting the stages of his life as writer, lover and priest. Through a series of sumptuous tableaux inspired by illuminated miniatures, we are drenched in a rubescent pageant of mime and movement quite unlike anything experienced before or, indeed, since. 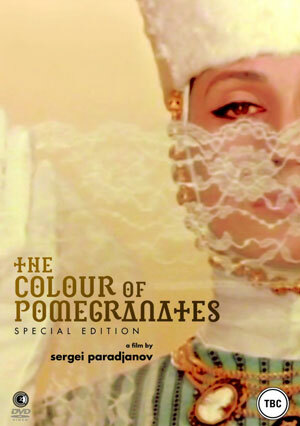 Moreover, given that after the film’s release in 1969, Sergei Parajanov spent more than three years in a Soviet prison for perceived subversive proclivities while simultaneously suffering the indignity of seeing his artistry re-edited and given a limited release schedule, it is all the more astonishing that we are privy to its recently remastered glory at all. “A book must be cherished and loved, for a book is both life and soul. If there were no written word, the ignorant would rule the world. 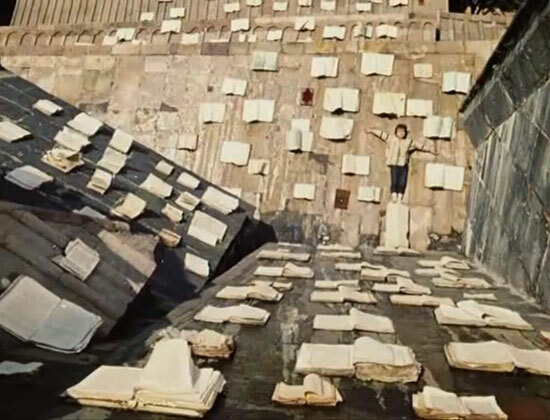 Read a book loudly for all to hear, for not everyone can read.” And thus the film commences its exquisite portrayal of the inner being of a sensitive and soulful poet upon its journey towards artistic expression and spiritual self-belief. 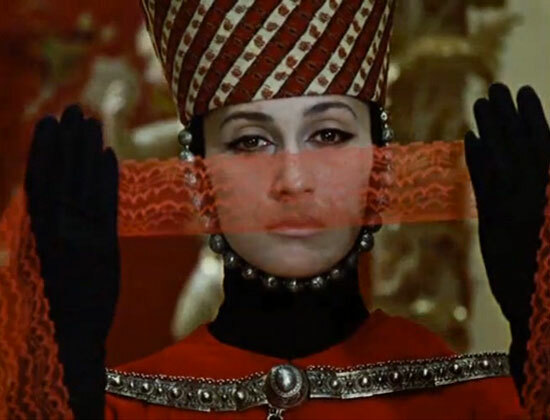 Segmented into chapters—Childhood, Youth, Prince’s Court (where Sayat Nova falls in love with a tsarina), The Monastery, The Dream, Old Age, The Angel of Death and Death—The Colour of Pomegranates is an aesthetic and intellectual tour de force. 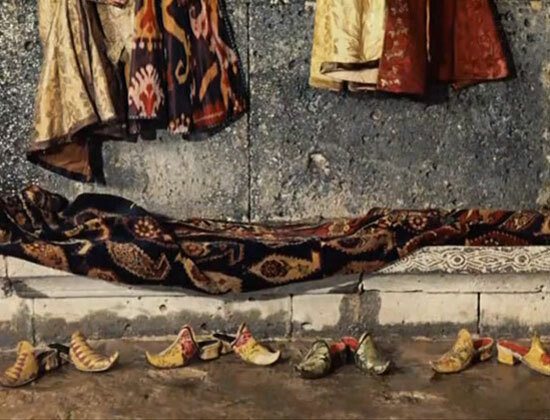 Furthermore, as a devotee of the films of Andrei Tarkovsky, the Armenian director pays his own homage to the depiction of dreamlike imagery infused with the dramaturgy of colour, acoustically overlaid with ambient reverberations and the ululations of traditional Eastern European folk song, presenting to us a cornucopia of the cultural arts. A ruby rich of Mount Bedakhsh, my love, thou art to me. 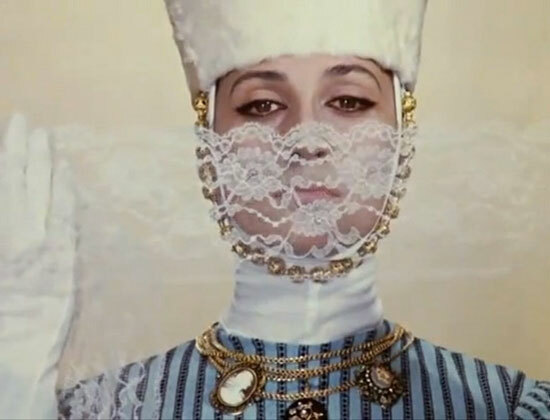 Sergei Parajanov chose his muse, the actress Sofiko Chiaureli, to play both the part of the poet, Sayat Nova, and the tsarina, Anna. The juxtaposition of male and female character portrayed by the same performer creates an arresting reflective harmony, whereby they are literally in tune with the rhythm of each other’s soul (as well as hinting at the director’s own homosexuality). 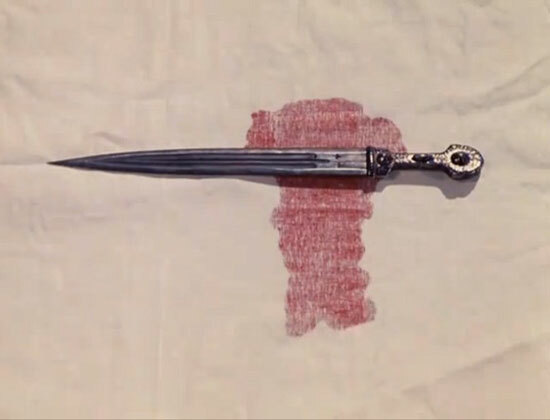 The sequences in which the poet courts the young empress, first in hues of coral blue and then in deepest vermillion, must rank as the most stylishly seductive in cinematic history. As monks chant an evocative plainsong, the lovers consummate their passion in an abandoned mausoleum, the ever-presence of death forming the backdrop to their illicit tryst, for paramours they can only ever be, never to be joined in holy matrimony with the opportunity to beget progeny of their own—Sayat Nova’s heart is directed to a higher purpose and the cloister is where his path is now destined, the production of poetry to be usurped by the contemplation of prayer. 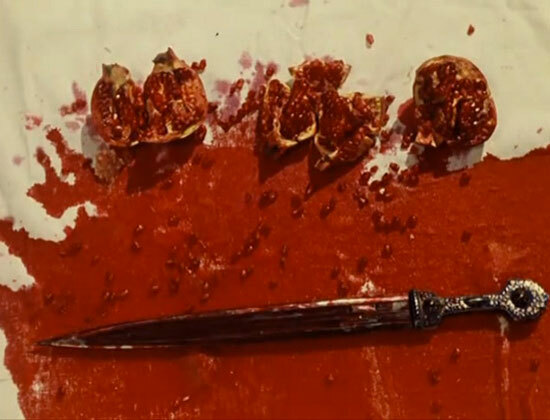 Originally, The Colour of Pomegranates was cut in the Armenian language and embodied a nonlinear, stream of consciousness narrative; the Soviet sensors were unhappy, nevertheless, and during the director’s imprisonment, a Russian edition was put together and distributed, one which told the tale of Sayat Nova’s life in a more conventionalized structure. Indeed, to make any sense of the drama, it is vital that the viewer watch the additional feature, Memories of Sayat Noya, in the special bonus section of the DVD, which gives an outline of the action and the meaning of key passages within the film, rendering at least an appreciation of the plot and dramatis personae. 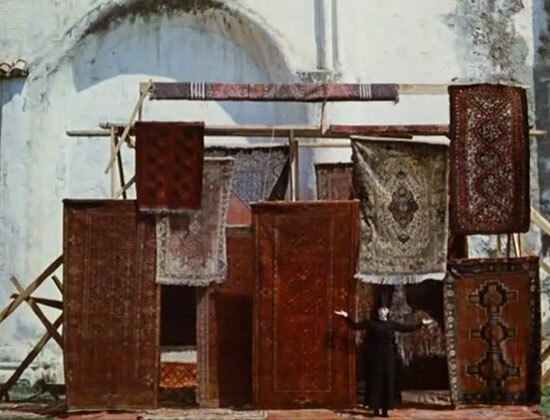 Sayat Nova’s time in the friary (filmed at the famed mediaeval Haghpat monastery in Armenia) affords tranquillity and stillness and yet within the inner chambers of his being, there burns a latent desire for all the sentient comforts of his youth. Memories of his parents flood his waking consciousness and his dreams are permeated with longing for his lost love. Moreover, his passion for writing poetry is reignited when a rival bard challenges his literary reputation as the greatest troubadour of all. Incensed, the priest takes leave of the monastery in order to face his poetic rival and yet when he stops to quench his thirst only to discover that the well is barren, Sayat Nova finally understands that his days as a poet are no longer and he returns to the cloister to live out the rest of his life in obscurity and insignificance. The symbol of fertility and abundance, it may seem superficially odd that a film examining renunciation of desire and worldly achievement should choose to use the pomegranate as a poetical allegory; and yet, as an intrinsic emblem of the myth of Persephone, the Greek goddess queen of the underworld representing the continual cycle of growth, dormancy and re-growth that governs all things in the physical universe, the bulbous fruit is a fitting metaphor for the human spirit finding redemption, rejuvenation and release.